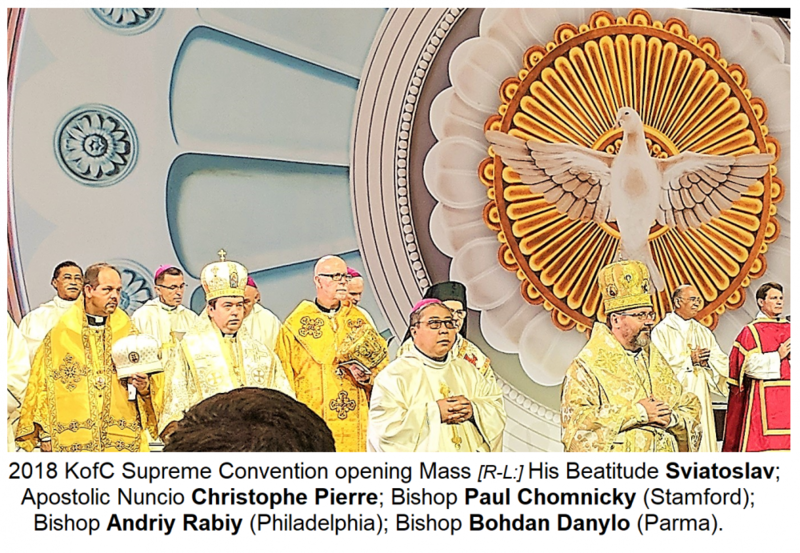 The second day of the 2018 136th annual Supreme Convention of the Knight of Columbus began with a truly soul-lifting Eucharistic Liturgy with the participation of very many bishops and clergy and, by one estimation, about 2.5 thousand lay attendees of the convention. Among the hierarchy was the Father and Head of the Ukrainian Catholic Church, His Beatitude Sviatoslav (Shevchuk). As the Head of the largest Eastern Catholic Church, he was appropriately given a place of honour right beside the representative of the visible head of the Catholic Church, the Pope Francis' Representative to the United Nations, Archbishop Bernardino Auza. Following the grand Mass, there was a break for lunch and then the first official session of the Convention began at 1:00 PM. 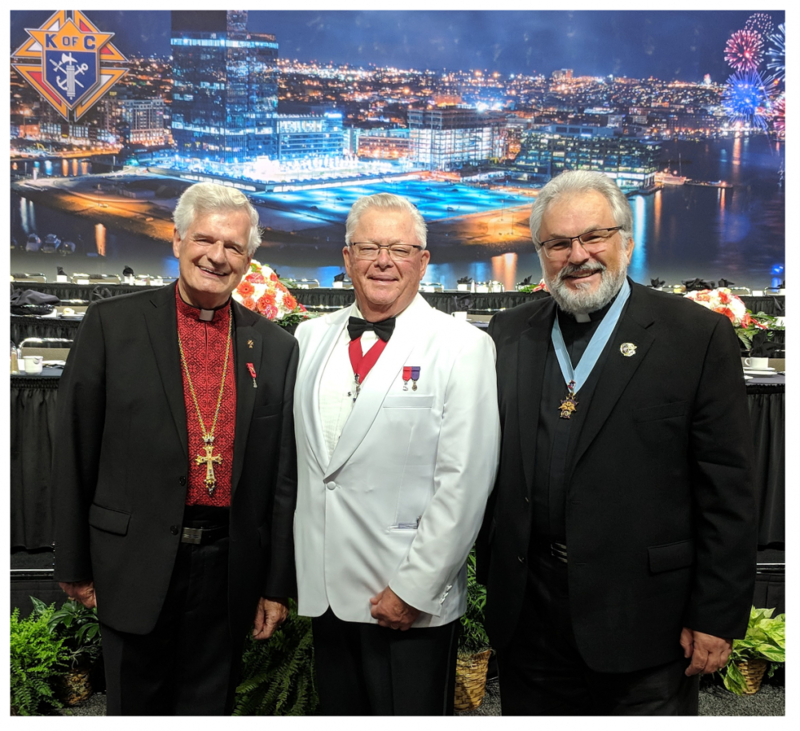 During the session, the Supreme Knight, Carl Anderson, gave his traditional report on the activity of the Knights of Columbus worldwide over the past year. He also speaks about the present state of the Order and the challenges and goals that it will face and embrace in the year ahead. 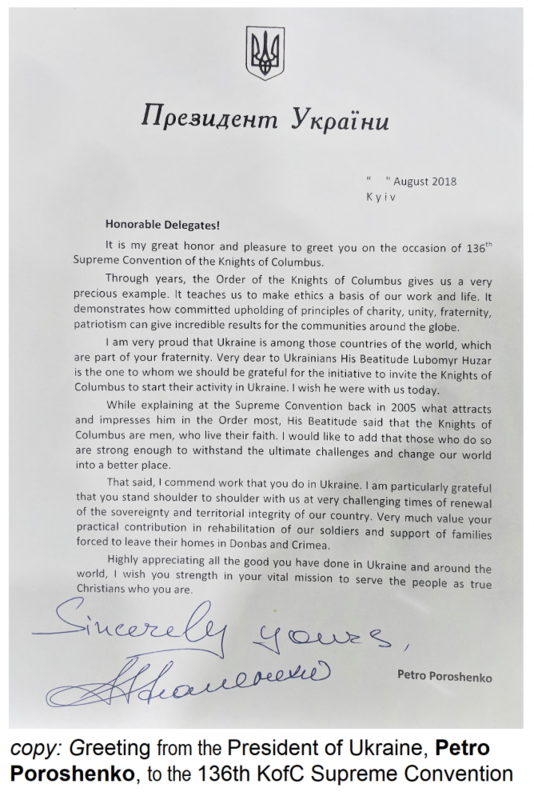 During this report he spoke at some length about the progress of the Knights in Ukraine... how the Order has expanded and about all their good charitable accomplishments. 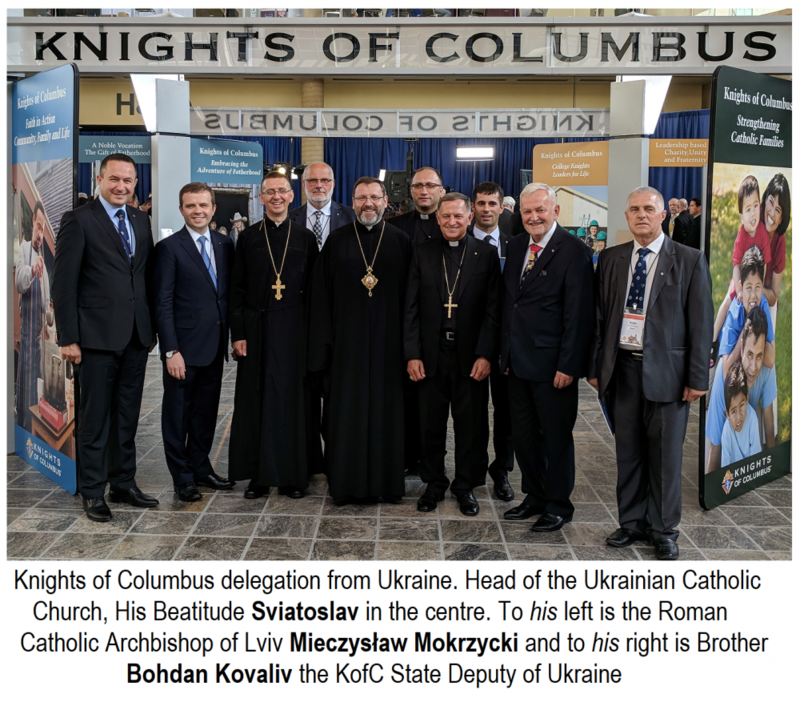 He also announced that the jurisdiction of the Knights of Columbus in Ukraine was officially raised from the status of a "territory" to that of a "state". [In political terms, this might correspond to a "territory" becoming a "province", or in ecclesial terms, an "exarchate" become an "eparchy".] This was extraordinary news, considering that the Knights had been operating in Ukraine for well under a decade. There are now over 1000 Knights in Ukraine associated with some 25 councils. 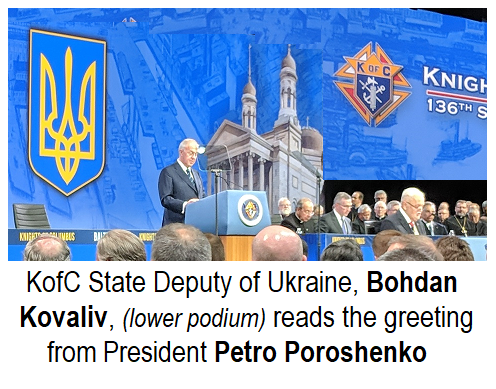 The announcement about the change in the Knights' status in Ukraine was made when the newly established "State Deputy" for the Knights of Columbus in Ukraine, Kyiv-based, Brother Roman Kovaliv was invited to come forward and read greetings from Ukraine's President Petro Poroshenko. Among the greetings from heads of the State and Religious dignitaries that were also read at the session were those from Pope Francis, President Donald Trump and the President of the Philippines, Rodrigo Duterte. 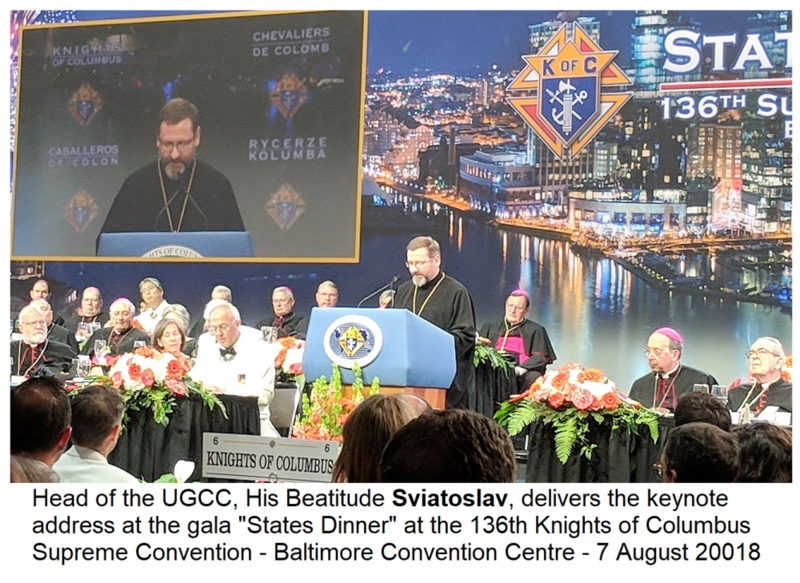 At the State Dinner, that began later that evening, the Ukraine delegation was not only given places of honour, but His Beatitude was the special guest of honour, who also gave the Keynote Address at the banquet. During the meal, before the formalities and speeches and such get under way, it is a custom to salute each "state" (which in Knights-speak means jurisdiction of a certain status... it could mean a state in the US, a province in Canada, or an entire country until it develops to the point where it contains numerous "states" itself... like Ukraine at the present time). So, a song was sung for Manitoba State, a song for the Dominican Republic, one for each of the provinces of Canada or states in the US, etc. As the song is sung, the delegates from that state rise and cheer and wave their particular flag. Often at least one or more other states will join in the revelry in solidarity. Well, when the song for Ukraine was song, it was truly moving to see how many hundreds of delegates from other "states" rose to join in in support of Ukraine. 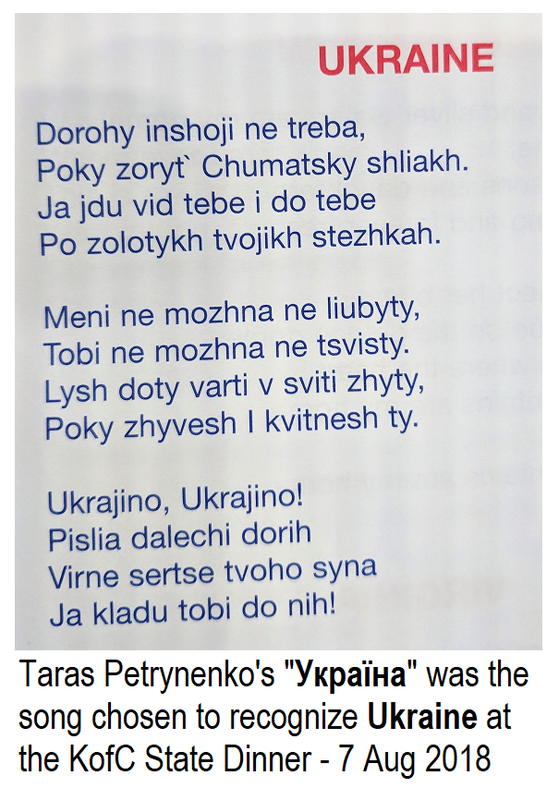 The Ukrainians joined in the singing as the song chosen was the popular "Ukrajina" by popular artist Petro Petrynenko. Of course, His Beatitude together with the Supreme Knight and his wife and many more on the dais also rose, waving their flags. 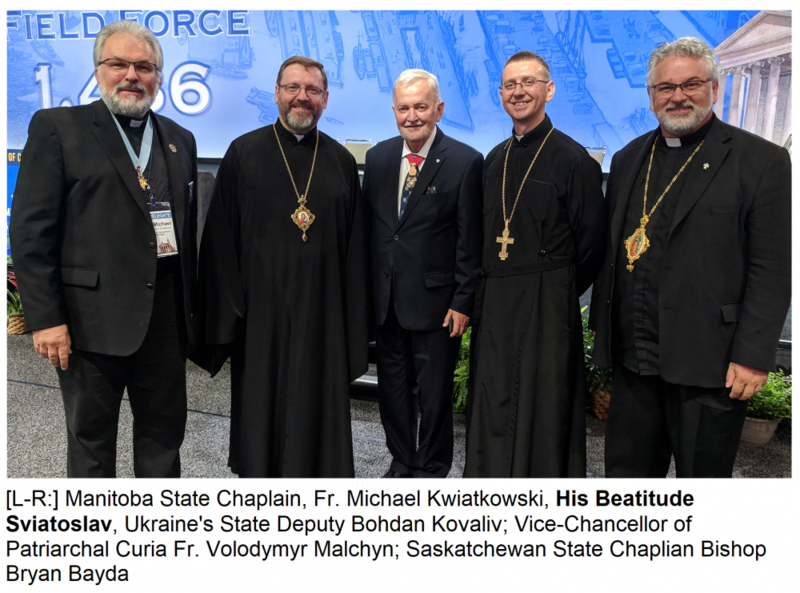 Needless to say, that the Ukrainian Catholic Bishops from the US and Canada also rose to their feet as did many of their colleagues from the Roman and other Easter Catholic Churches. The evening ended with a prayer and blessing being offered by the Roman Catholic Archbishop of L'viv, Ukraine - M. Rev. Mieczysław Mokrzycki, who at one time served as the personal secretary of Pope St. John Paul II.